I’m not sure if it’s her amazing knitting or her amazing photography that draws me to everything Ann knits! 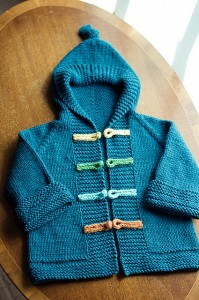 I check out her blog and bam, I wanna put something new (and usually identical) on the needles. The latest knit from Ann is Duck Soup, an absolutely adorable baby sweater. I’m not sure if I love the frog closure detail on this sweater the best or the little dangly on the hood. 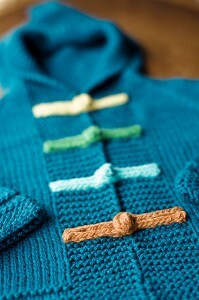 I think a spark of colour turns a knit from something cute to something extraordinary. 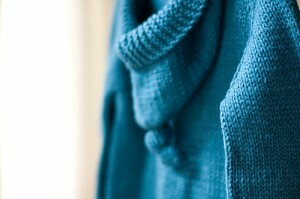 The colours you choose make that knit personal to you and the person you make it for. The hoodie is an excellent baby item too. I love dressing Hunter in a hoodie, it makes her look kind of elfish and it’s a good backup in case you forget to bring a hat. The warm weather can’t last long so it’s the perfect time of year to knit up a sweater that can be worn all fall and winter. Ann knit this little wonder out of Spud and Chloe sweater, a washable yarn that’s a combination of wool and cotton. The colour is my favorite too, Moonlight. This entry was posted on Tuesday, August 23rd, 2011 at 8:52 am	and is filed under Uncategorized. You can follow any responses to this entry through the RSS 2.0 feed. Both comments and pings are currently closed.